I heard an amazing testimony this week of a man who was facing an insurmountable challenge and how he got incredible results from his prayer. God had made a way! What was the key to his prayer being answered? Although there was no obvious solution in the natural, throughout the ordeal our friend chose to trust God and remain at peace. It reminded me of the Lord’s promise to each of us, “If you remain in me and my words remain in you, ask whatever you want, and it will be done for you.” (John 15:7 NET). According to John 15 verse 7, God will make a way when we trust in His Word and REMAIN IN HIS PRESENCE! In His presence there is PEACE – no stress, confusion or turmoil. In His presence there is JOY – no sadness, regret or discouragement. In His presence there is LOVE – no condemnation or guilt, only total acceptance! This week I had a chance to put this to the test. Bill and I have made provision in our home for BnB. Our goal is to help support our granddaughter who wants to be a medical missionary. She has taken a year’s break from her University studies to go to YWAM, to do Discipleship Training and serve on the Mercy ship. While making the beds, I twisted my back and caused a disk to slip, damaging the nerves. It was too painful to sit and even to stand, to walk or lie down was painful! After two days of pain, I decided to change my focus. I chose to focus on and become aware of the presence of God, instead of my pain. Several times a day I prayed: “Jesus, I give you my affection and worship you. Thank you for dying for my healing.” By the end of the day I could sit and instead of the pain being 10/10, it was 2/10. The next day I had no pain. 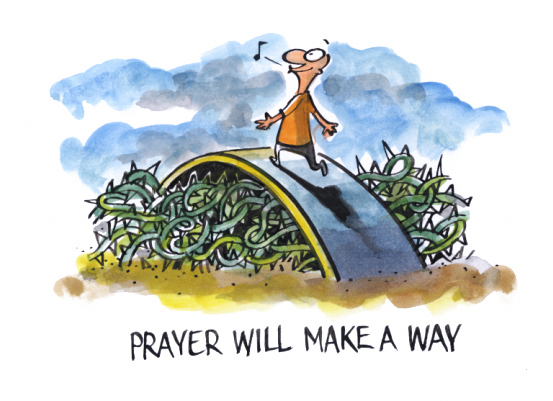 Was there a key to how to pray effectively and get results? Instead of focusing on my problem, I was becoming aware of the presence of King Jesus – of His rule, power and might to heal me. So, whatever your situation is, practise abiding in God’s gracious, loving presence and declaring His word. He has promised to answer your prayer if you remain in Him; resting in an awareness of His presence. You’ll discover, like me, that in His presence there is fullness of joy, perfect peace, unconditional love and your breakthrough!